Meet Penelope, a 7-year old Chorkie. She was presented to us at Highland Veterinary Clinic because she was vomiting blood. Her owners are unable to afford any kind of diagnostics and treatment due to recent lay-offs. By lending a helping hand to Penelope, we can save and care for her until her condition gets better. 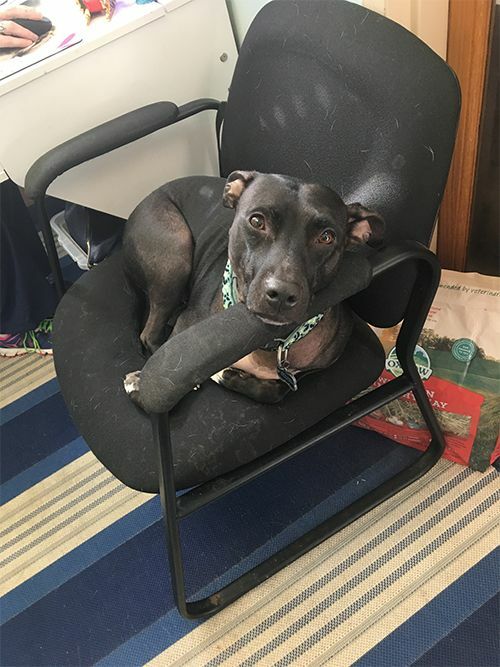 We would love to save this sweet girl, and need our community’s help to afford the special labs and diagnostic imaging she will need in this situation. Visit us at the hospital to donate in person, or visit https://www.highlandvet.net/contact-us and select the AVMF Help US, Help Animals button to make a credit card donation. When donating online, be sure to direct your donation to Highland Veterinary Clinic. As we wind down 2017 and prepare to welcome the New Year, we take this opportunity to thank you for being our Highland Veterinary community. We appreciate your trust and are honored to serve pets, families, our community, and our team members. Rosie D. was presented to us by Evansville Animal Care and Control, and we were able to provide emergency triage, diagnostics, and care planning through the generosity provided by the Evansville, Indiana community and the Spirit Medical Fund for homeless animals with emergent medical needs. Unfortunately, to serve as many animals as possible, the Spirit Fund was limited in the amount of recovery and care that it could provide for Rosie, and she was not claimed and required further care. When Rosie presented she suffered from a head injury (cause unknown) and was unable to walk, feed herself, or react to normal stimuli. Crystal O'Mullane remembers her profound concussion caused Rosie to be alert, frightened, but her own movement was not within her control. Highland donated the veterinary care, assisted feeding, rehabilitation, and continuing medications to help Rosie—while this meant an extended stay for Rosie, she was surrounded by progressive nurses and vets who were were given the capacity, time and space, to do what we love for animals. We also gave Rosie a second chance and the gift of a human and animal bond which has enhanced the lives of her new family members! 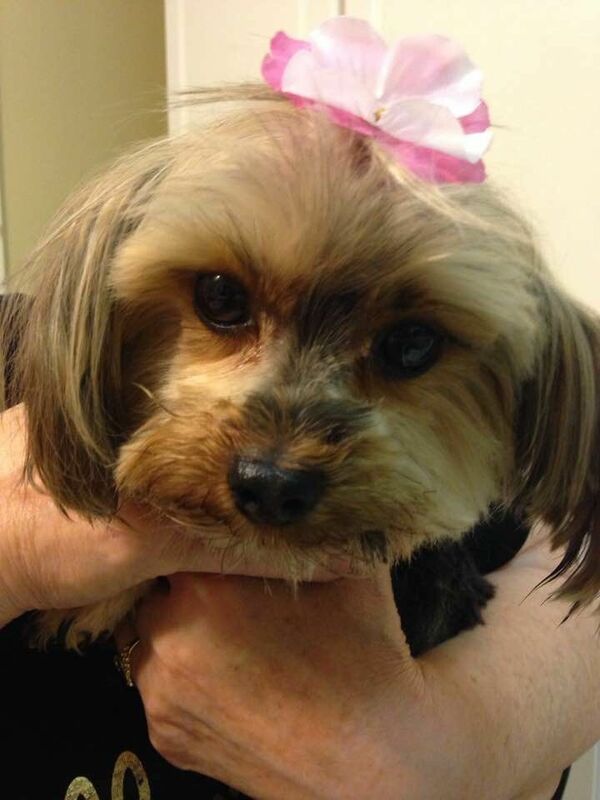 One of our pet owners in the HVC Community, Suzi D., generously stepped up to offer Rosie the perfect loving home and paid for her preventative care. 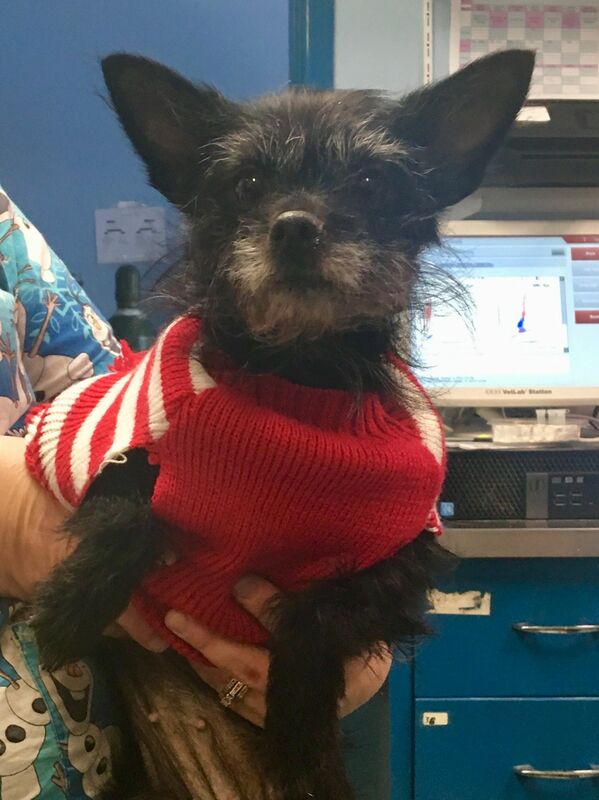 Today Rosie is a spoiled, confident, yet loving little dog who you might never suspect has been injured and abandoned. We are excited to announce that our mission to help animals like Rosie has been extended in it’s capacity and availability. Fortunately for animals like Rosie, our hospital is enrolled in the AVMF Veterinary Care Charitable Fund® program. Through this program, our clients, family and friends can make donations that allow us to provide charitable care to those who need a little help. This includes our clients facing hardships, animal victims of abuse or neglect, and animals rescued by Good Samaritans that find their way through our front door, or are presented in partnership with our shelter/rescue partners. Your gift to the American Veterinary Medical Fund will give homeless animals, animals whose families are in crisis, and animals who are victims of natural disasters or abuse the ability to get well again. In this season of giving, please consider making a year-end tax-deductible donation to the AVMF on our behalf so we can plan for more amazing stories in 2018. Visit us at the hospital to donate in person, or visit https://www.highlandvet.net/contact-us and select the AVMF Help Us, Help Animals button to make a credit card donation. When donating on line, be sure to direct your donation to Highland Veterinary Clinic. Hope. was presented to us by Another Chance for Animals in partnership with EACC, and we were able to provide emergency triage, diagnostics, and care planning through the generosity provided by the Evansville, Indiana community and the Spirit Medical Fund for homeless animals with emergent medical needs, and volunteer efforts of Another Chance for Animals. Due to severe neglect and emaciation, Hope presented as 17.5 lbs, when she should have weighed 35-40lbs!! Unfortunately, Hope suffered from re-feeding syndrome. A disorder that effects extremely emaciated animals whose bodies do not react to normal dietary intervention. Hope’s life was in danger. She collapsed, could not digest normal foods, and her immune system was not cooperating. Highland donated the veterinary care, dietary planning in consult with a veterinary nutritionist; the assisted feeding, rehabilitation, and continuing medications to help Hope—while this meant an extended stay for Hope, she was surrounded by progressive nurses and vets, and certified culinarian, who were given the capacity, time and space, to do what we love for animals. Hope was adopted by Melissa Gormley, who provided the perfect loving, special needs home and paid for her preventative care. Today Hope has beautiful skin, never is pain nor vomiting, eats great food, weighs 37lbs, runs circles around her house, and farm, and you might never suspect the medical and physical neglect she had previously suffered. We are excited to announce that our mission to help animals like Hope has been extended in it’s capacity and availability. Fortunately for animals like Rosie, our hospital is enrolled in the AVMF Veterinary Care Charitable Fund® program. Through this program, our clients, family and friends can make donations that allow us to provide charitable care to those who need a little help. This includes our clients facing hardships, animal victims of abuse or neglect, and animals rescued by Good Samaritans that find their way through our front door, or are presented in partnership with our shelter/rescue partners. Your gift to the American Veterinary Medical Fund will give homeless animals, animals whose families are in crisis, and animals who are victims of natural disasters or abuse the ability to get well again. This is Les Nessman JG. A very kind elderly gentleman found him collapsed in the grass on his lawn when he was merely 5-6wks old—September 19th, 2013. He had collapsed from flea anemia, poor nutrition, and intestinal parasites. Highland donated the veterinary care, Molly Welch treated him carefully for shock and the fleas, and he was hospitalized. 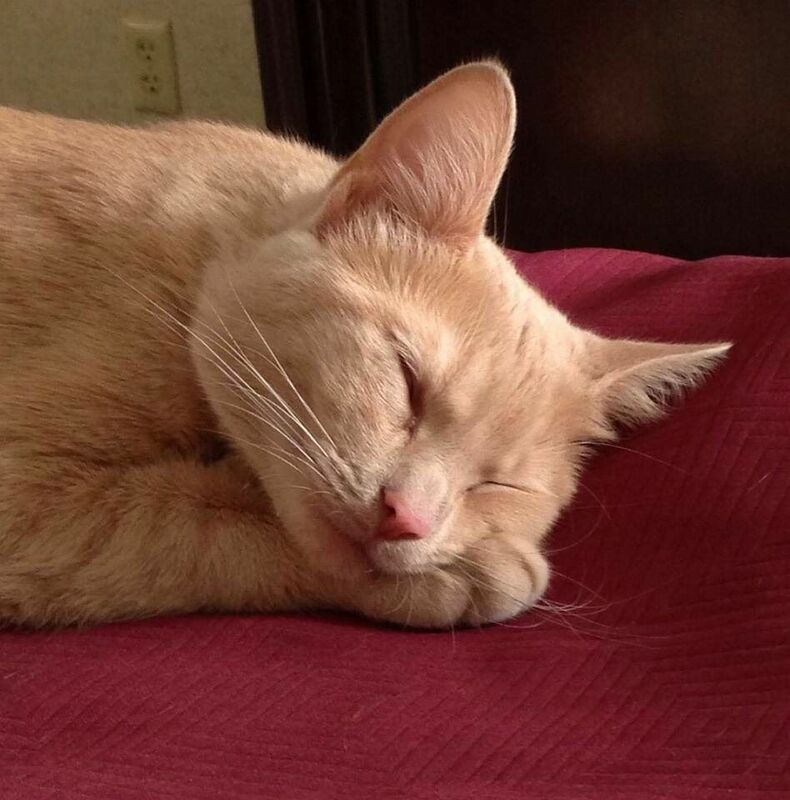 When the elderly couple did not have the capacity to care for a kitten at their home, Highland stepped in and made sure he was able to be given the veterinary preventative care and chance that he needed to find his way to an adoptive home. Around Thanksgiving 2013, Molly was ready to see him placed in his furever home and named him Les Nessman after the TV show WKRP in Cincinnati's big Turkey Drop Episode! This attracted the attention of some amazing people and Les was adopted by Dawn JG and Ray G. Today Les is a whopping force to be reckoned with today! Les was so lucky to be given the time and care he needed to find his way to a family who was able to care for him for his whole life! We are excited to announce that our mission to help animals like Les has been extended in its capacity and availability. Fortunately for animals like Les, our hospital is enrolled in the AVMF Veterinary Care Charitable Fund® program. Through this program, our clients, family and friends can make donations that allow us to provide charitable care to those who need a little help. This includes our clients facing hardships, animal victims of abuse or neglect, and animals rescued by Good Samaritans that find their way through our front door, or are presented in partnership with our shelter/rescue partners. Your gift to the American Veterinary Medical Fund will give homeless animals, animals whose families are in crisis, and animals who are victims of natural disasters or abuse the ability to get well again. At the time of peace and giving, a man found this white pigeon who resembles so much a dove of peace. Dr.’s Gormley and Turpen have identified an old fracture which they will give time to heal. 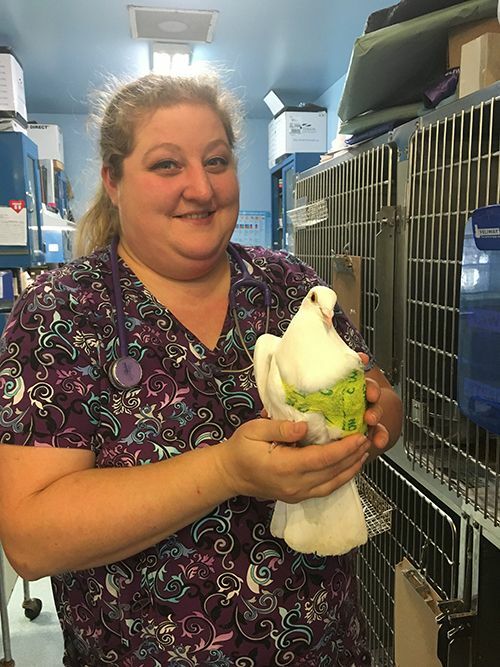 Highland Veterinary Clinic has donated the radiographs needed to determine this bird’s injury, the medications needed to prevent pain and suffering, and we wish to thank the Maisy S. family for taking the bird in to nurse him back to health. Now named “Ivory,” he is leading a rich and full life in a foster home. He coos, keeps Maisy company while she does schoolwork and appreciates every day. On Friday, Dr. Turpen will determine if amputation will be needed for Ivory to lead a pain-free and full life in a home. If this procedure is needed, we need help to cover the cost of anesthesia, pain medication, rehab supplies, and nursing care. After recovery, Ivory will be looking for a person who loves birds to live out his days as a testament to our mission and our community’s compassion. We are excited to announce that our mission to help animals like Ivory has been extended in its capacity and availability through a new source of funding. Fortunately for animals like Ivory, our hospital is enrolled in the AVMF Veterinary Care Charitable Fund® program. Through this program, our clients, family and friends can make donations that allow us to provide charitable care to those who need a little help. This includes our clients facing hardships, animal victims of abuse or neglect, and animals rescued by Good Samaritans that find their way through our front door, or are presented in partnership with our shelter/rescue partners. Your gift to the American Veterinary Medical Fund will give homeless animals, animals whose families are in crisis, and animals who are victims of natural disasters or abuse the ability to get well again.